This spread is made from the simple combination of cilantro, peanuts, bell peppers, fresh lemon juice for acidity, and fresh jalapenos for that added kick. When I was younger, I couldn’t tolerate much spice so I had this chutney without the fresh jalapenos, but now I love the spiciness. Growing up, my mom always had this fresh chutney in the fridge, and now I’ve made it a staple in my fridge as well. The only change I made to my mom’s recipe was green bell peppers to improve the texture, taste, and consistency. Simple Chutney-Butter Sandwich. Take two slices of your favorite bread. Spread this Chutney on one slice, your favorite spreadable butter (such as vegan earth balance butter) on the other slice, and sandwich them together. Veggie Chutney Sandwich. (pictured below) Spread this Chutney on two slices of whole wheat bread (I prefer mine toasted). 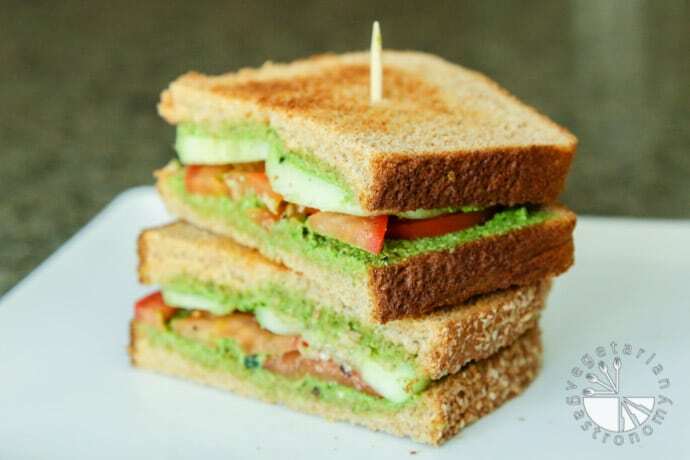 On one slice, layer the following: cucumber slices, tomato slices, and baby spinach or romaine lettuce (optional). Sprinkle with freshly ground black pepper and sea salt, and top with the second slice of bread. Breakfast Chutney Open-Faced Toast. Toast one piece of whole wheat bread. Spread a thin layer of this chutney. Layer either sliced cucumbers or sliced tomatoes. Sprinkle with sea salt and freshly ground black pepper. THIS IS MY CURRENT BREAKFAST ADDICTION! Dip. This chutney makes for a great dip! Use with fresh veggies, pita bread, savory crepes (lentil Dosa, cream of wheat Dosa – recipe to come), samosas (baked tortilla pockets stuffed with curried potatoes – recipe to come), any type of veggies dipped in chickpea flour batter and baked or fried (recipe to come), etc… the list could just go on and on. Dressing. With any salad or dried savory mix. I’ve also found myself eating this chutney with a spoon or as a side to many dishes. In fact, writing this post and thinking about the flavors makes me want to get up and make a chutney sandwich right now! And if I haven’t already convinced you to do the same, just take a look at the ingredients list below – super simple ingredients you probably already have in your house. Make some…I promise you won’t be disappointed! 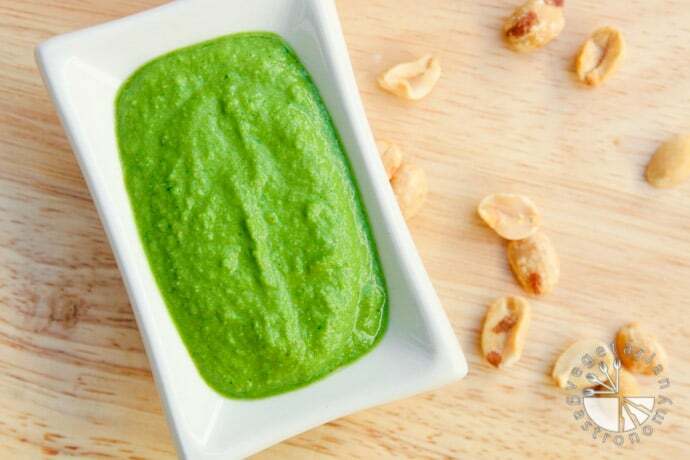 Cilantro, peanuts, citrus, and spice brings this spread alive! 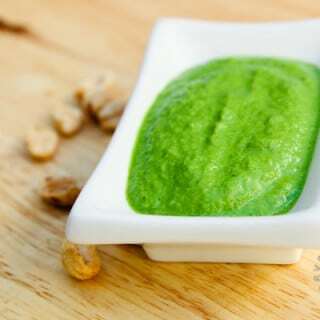 Use it as a chutney, dip, or dressing to flavor up any dish! Add all the ingredients listed in a small blender (such as a magic bullet). Puree until all the ingredients are completely blended. If necessary, feel free to add a tiny amount of water to help start the blending process. 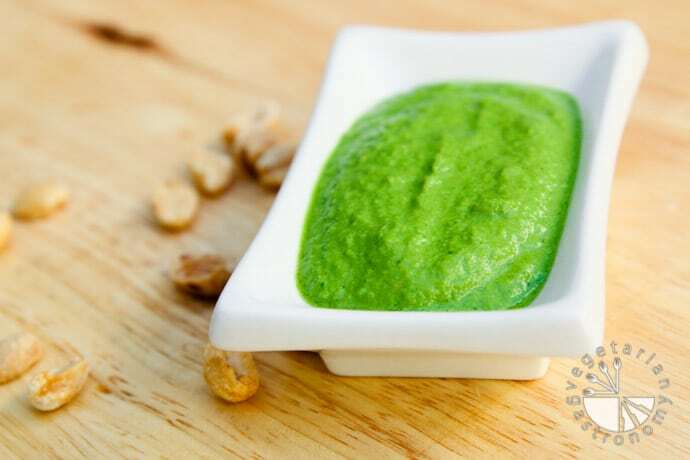 Note that the final product after blending should have the thick consistency of a spread (note: if you are using this as a dressing, feel free to add more water to get the desired consistency). Taste and season with additional lemon, salt, and sugar if needed. Enjoy as a spread for sandwiches, dip for savory bites, or as a dressing. Thank you! It's one of my favorite chutney/spreads to make! I can eat it all week...sandwiches, simple tomato toast, use it as a dip, etc. And it freezes really well! If you get a chance to try it out let me know what you think! Hi Jennifer! I've never actually tried using thick natural peanut butter in place of the whole peanuts, but absolutely. I don't see why you couldn't use it. The resulting chutney may be a little smoother with the peanut butter instead of the peanuts, but should be similar and taste great! Start off with less and add as needed based on taste! Great idea...I've never thought of doing that. If you make it, let me know how it turns out! And thank you so much for the kind words and following my blog! Chutney was good . Tested so good on bread with all veg.